For more information, see Adaptive settings. NOTE: Enabling adaptive settings will cause .NET4 to be installed with the agent. Name: The name for this adaptive setting. Rules: Move the rules you want applied from the Available rules list to the Selected rules list. Click Move up and Move down to change the order if necessary. Click New... to open the Edit adaptive setting rule dialog box. If no rules apply: If no rules apply, you can use the default agent configuration settings (in other words, don't change anything) or you can select a specific rule to apply from the Apply the following rule list. Lock windows session if location services are disabled: Click to lock the device when location services are disabled, such as when someone leaves your office building or if someone turns on airplane mode. Check GPS location every: The default is two minutes. Frequent checks will reduce device battery life. Set as default within agent config : Makes this adaptive setting the default for new agent configurations. Clicking New or Edit in the Adaptive settings dialog box shows the Edit adaptive setting rule dialog box. 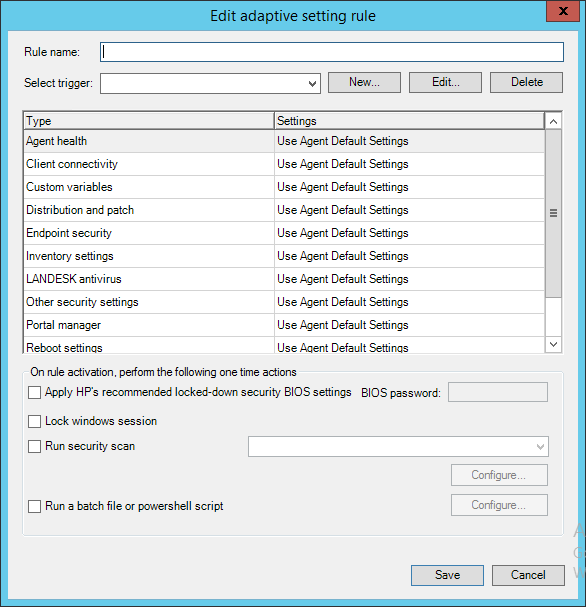 An adaptive settings rule associates a trigger with one or more agent settings to override when the trigger activates, along with additional one-time actions, such as locking the screen. Rule name: The name for this rule. Select trigger: Shows available triggers. Use New if there aren't any or if you want to make a new one. Triggers can be either geo fence or IP address range. New... Opens the Edit trigger dialog box, where you can configure a new trigger. Type/Settings: In the settings list, select the agent setting you want to use for each type. On rule activation, perform the following one time actions: Adaptive settings rules can have one-time actions that execute when the rule activates. Select any one-time actions that you want run for this rule. Run security scan: Runs the security scan that you select. Click Configure and select a scan. Run a batch file or powershell script: Click Configure and select a batch file or powershell script. Trigger name: The name for this trigger. Geofence: Requires Windows 8 and a device with a GPS. Click and drag the map so the red cross-hair is over the location you want to geofence. Use the scroll bars to zoom in and out. The target radius circle defaults to 10 meters. Increase the Radius if you want it to include a corporate campus, city, and so on. The minimum device accuracy determines how accurate the GPS reading must be for the trigger to activate. If the GPS-reported accuracy exceeds the value you specify, the trigger won't activate. IP address range: Works with any Windows device. The Verify core existence on the network option can help prevent network spoofing by making sure the Ivanti® Endpoint Manager powered by Landesk core server is visible to the device. Don't use this option with IP address ranges that won't have access the core server.